Converting videos can be confusing. 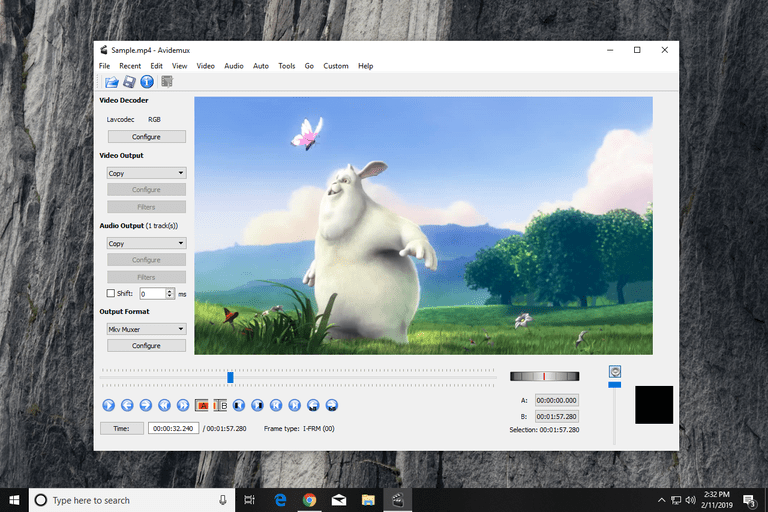 Avidemux is a free video converter that accepts the most common video formats and supports filtering and cutting videos into sections before converting. The program might be a little hard for some people to use because it's not just a straightforward video converter where you load the video and choose an output format. However, it does indeed function as a video file converter even though it includes other, advanced options, too. View lots of details about the video: audio and video codec, image size, aspect ratio, frame rate, total duration, audio channel count, variable bitrate, frequency, and more. Avidemux isn't the easiest video converter program to use because it's not just a video converter. However, it does what it's intended to do even if it may take a little playing around to become familiar with the way things are setup. This program is a bit more advanced than similar ones, but it enables videos to be converted into common formats, which is always a plus. To convert a video is as easy as loading it through the File menu and picking the format you want to save the video to. The other options can be avoided if you're not interested in tweaking anything else. Go to File > Open... and find and select the video you want converted. Click Open to load the video into the program. Locate the Output Format area on the left side of the program and then pick a format to convert the video to. Go to File > Save to pick where to save the converted video. Click Save to start the conversion process. You'll know when the conversion is finished when you see the Done message prompt. The file is saved wherever you chose in Step 4. The video file formats below are what Avidemux supports. If your video is in any of the formats listed in the "Input Formats" section, it means you can load the file into the Avidemux program. The list of file formats in the "Output Formats" section is what you can convert the file to. For example, you can use Avidemux to convert MP4 to AVI and MKV to MP4. Like we said above, Avidemux may be difficult for some to use because it doesn't function solely as a video converter. There are other programs that might be easier to use, though, like Freemake Video Converter. We keep a list of other free video file converters if you'd like to try something else with more or less features, easier usability, support for more file formats, etc. There are so many video converter programs and even online tools that you should have no problem finding one that works for you.